You can't have a government website that disagrees fundamentally with the statements made by those running it. Major changes in the message sent by the United States government began the moment Donald Trump took his oath of office on January 20th. Shortly after the inauguration, all mentions of climate change and its human origins were deleted from the White House website. These pages have yet to be restored. These pages have yet to be restored. The administration continued to try and control their messaging with public information updates. 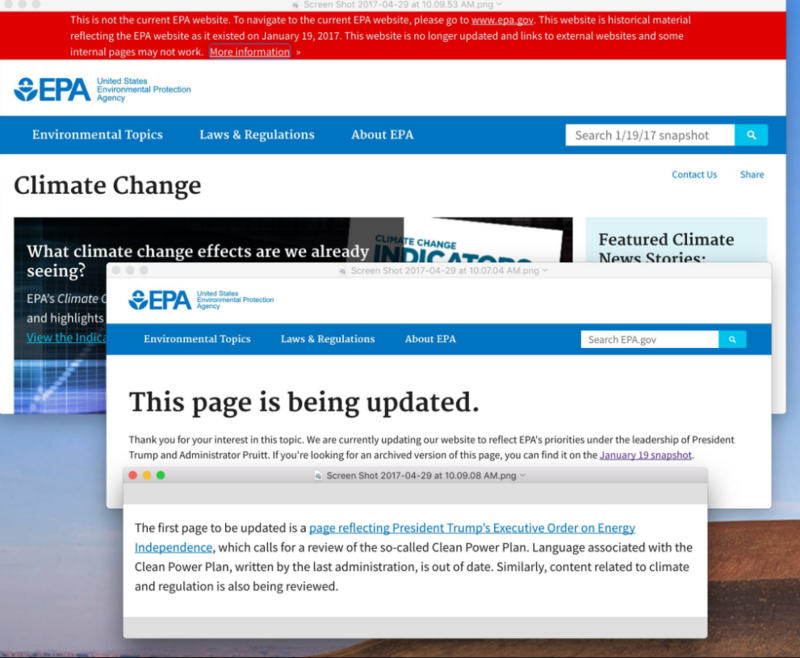 In their latest act, the website for the Environmental Protection Agency (EPA) has been purged of a great deal of the science related to anthropogenic global warming. One of the removed pages was recently used to refute claims made by Scott Pruitt, the head of the agency. In an interview last month with CNBC, Pruitt stated that “measuring with precision human activity on the climate is something very challenging to do and there’s tremendous disagreement about the degree of impact, so no, I would not agree that it’s a primary contributor to the global warming that we see.” Previously the page stated that “it is extremely likely that human activities have been the dominant cause of that warming.” It comes as no surprise that the administration is removing this language from its site. You simply cannot have an agency’s website fundamentally disagreeing with the statements made by those running it. The top level EPA page now refers to a “Back to Basics” approach, which apparently includes an agenda with three tenets: protecting the environment, engaging with partners, and sensible regulations for economic growth. Examples of this approach show Pruitt meeting with workers at a coal power plant.